This page covers the author of Cut. For other authors named Patricia McCormick, see the disambiguation page. 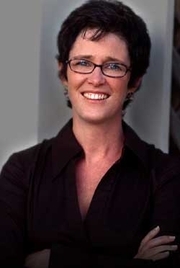 Patricia McCormick is the author of five powerful novels with subjects ranging from the psychological suspense in Purple Heart (2009), to teenage substance abuse in My Brother’s Keeper (2006). She has been recognized with numerous awards including one of Best 100 Books of the Year by Publishers Weekly, one of the Top Ten Best Books for Young Adults by the American Library Association, and an ALA Best Book for Teenagers. Her most recent work, Never fall down (2012), tells the true story of an 11-year-old boy who survived the Khmer Rouge in Cambodia by playing music. Archbishop Desmond Tutu called it "One of the most inspiring and powerful books I’ve ever read. Never fall down can teach us all about finding the courage to speak our truth and change the world." Joining her will be Emily Danforth, whose debut novel, The Miseducation of Cameron Post (2012), is currently a finalist for the William C. Morris YA debut award. The coming-of-age story centers on Cameron, a young girl growing up in Montana, whose parents die in a car crash as she struggles with growing up gay. She's sent to live with her grandmother and her conservative aunt, who upon discovering that Cameron has fallen in love with her best girlfriend, send her away to a de-gaying camp. The novel received starred reviews from Kirkus, Booklist, Publisher's Weekly, and School Library Journal, and was praised by an NPR reviewer who called it "a skillfully and beautifully written story that does what the best books do: It shows us ourselves in the lives of others." Both authors will read, sign books, and answer questions. "Patricia McCormick" is composed of 2 distinct authors, divided by their works. You can edit the division. Patricia McCormick is composed of 2 names. You can examine and separate out names.